Custom made roman numeral wedding band features 7 brilliant diamonds or gemstones set beautifully in your choice of 14k, 18k white or yellow gold or platinum band. This stunning roman numeral wedding band features 7 vivid blue sapphires set beautifully in a 7mm 14k gold band with your special date converted to roman numerals. 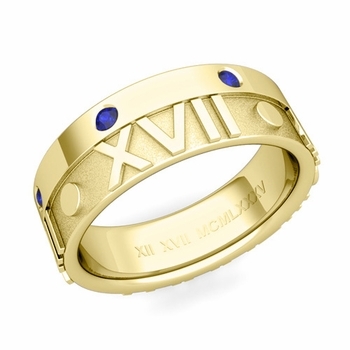 This stunning roman numeral wedding band features 7 vivid blue sapphires set beautifully in a 7mm 18k gold band with your special date converted to roman numerals. This stunning roman numeral wedding band features 7 vivid blue sapphires set beautifully in a 7mm platinum band with your special date converted to roman numerals. This stunning roman numeral wedding band features 7 vivid pink sapphires set beautifully in a 7mm 14k gold band with your special date converted to roman numerals. This stunning roman numeral wedding band features 7 vivid pink sapphires set beautifully in a 7mm 18k gold band with your special date converted to roman numerals. 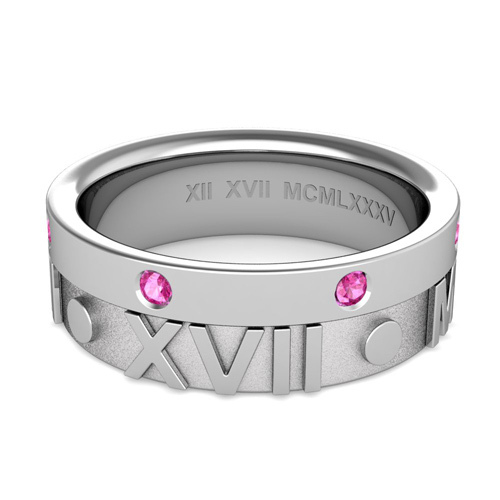 This stunning roman numeral wedding band features 7 vivid pink sapphires set beautifully in a 7mm platinum band with your special date converted to roman numerals. This stunning roman numeral wedding band features 7 vivid yellow sapphires set beautifully in a 7mm 14k gold band with your special date converted to roman numerals. 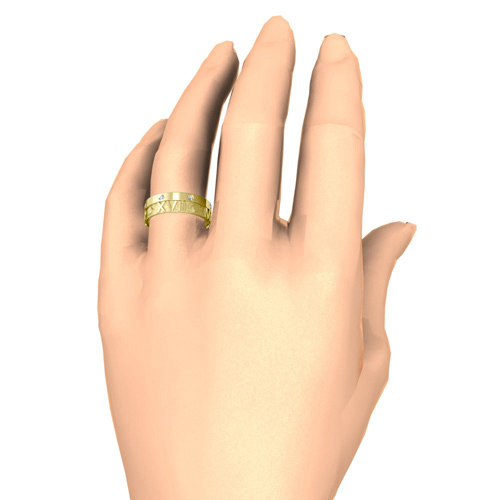 This stunning roman numeral wedding band features 7 vivid yellow sapphires set beautifully in a 7mm 18k gold band with your special date converted to roman numerals. This stunning roman numeral wedding band features 7 vivid yellow sapphires set beautifully in a 7mm platinum band with your special date converted to roman numerals. This stunning roman numeral wedding band features 7 vivid red rubies set beautifully in a 7mm 14k gold band with your special date converted to roman numerals. This stunning roman numeral wedding band features 7 vivid red rubies set beautifully in a 7mm 18k gold band with your special date converted to roman numerals. This stunning roman numeral wedding band features 7 vivid red rubies set beautifully in a 7mm platinum band with your special date converted to roman numerals. This stunning roman numeral wedding band features 7 vivid green emeralds set beautifully in a 7mm 14k gold band with your special date converted to roman numerals. 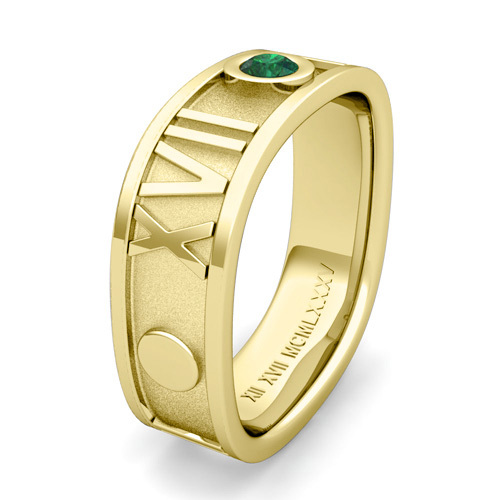 This stunning roman numeral wedding band features 7 vivid green emeralds set beautifully in a 7mm 18k gold band with your special date converted to roman numerals. This stunning roman numeral wedding band features 7 vivid green emeralds set beautifully in a 7mm platinum band with your special date converted to roman numerals. This stunning roman numeral wedding band features 7 round brilliant diamonds set beautifully in a 7mm 14k gold band with your special date converted to roman numerals. 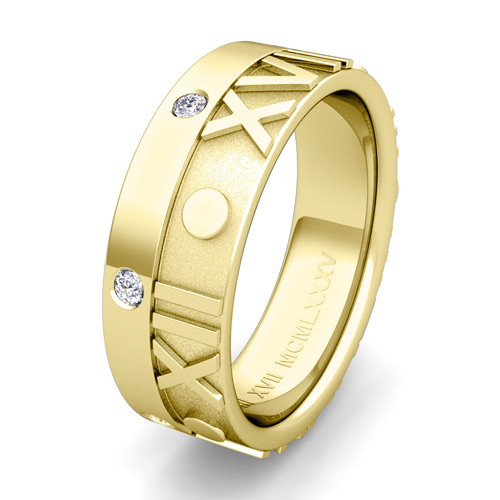 This stunning roman numeral wedding band features 7 round brilliant diamonds set beautifully in a 7mm 18k gold band with your special date converted to roman numerals. This stunning roman numeral wedding band features 7 round brilliant diamonds set beautifully in a 7mm platinum band with your special date converted to roman numerals. This stunning roman numeral wedding band features 7 black diamonds set beautifully in a 7mm 14k gold band with your special date converted to roman numerals. This stunning roman numeral wedding band features 7 black diamonds set beautifully in a 7mm 18k gold band with your special date converted to roman numerals. This stunning roman numeral wedding band features 7 black diamonds set beautifully in a 7mm platinum band with your special date converted to roman numerals.